This caught my eye. It is very different to what it appears at first glance. Haircut al fresco? No just a piece of cardboard against the fence. Ha, you had me fooled for a few seconds. Looks like a "fåtölj" to me. Yes, had me fooled too. 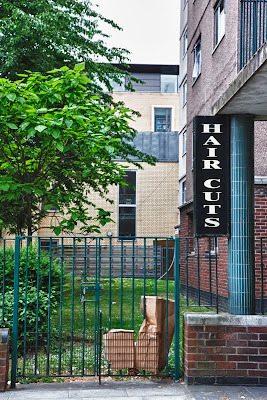 Interesting to speculate whether the sign should say Hair cuts or Hairs cut! I think an al fresco haircut might be kind of fun! It does look like a chair sitting there. What a wonderful and fun picture. Love it! Hard to cut hair in a comfy old arm chair though. You had me fooled 3. We do outside barbering. Well, I cut his hair outside so the birds have some feathering for their nests :-) and I don't have to get the hoover out. Al Fresco haircuts are indeed a fun expereince, which I enjoyed many times in Barbados. The cardboard box sure does look like a seat. Well, at least they wouldn't have had to worry about sweeping the floor after every cut!